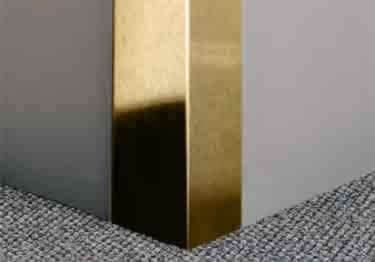 Protect corners from light impact with decorative "gold" anodized aluminum Metal Corner Guards. Constructed from 0.04" anodized aluminum, these attractive corner guards come in three gold finishes: satin gold, #4 brushed gold, or bright polished gold. Available in two style options for easy installation: peel and stick or standard (no adhesive backing). Sizes: 3/4" x 3/4" x 48", 3/4" x 3/4" x 96", 1" x 1" x 48", 1" x 1" x 96", 1-1/2" x 1-1/2" x 48", 1-1/2" x 1-1/2" x 96", 2-1/2" x 2-1/2" x 48", 2-1/2" x 2-1/2" x 96", 3" x 3" x 48", 3" x 3" x 96", 3-1/2" x 3-1/2" x 48", 3-1/2" x 3-1/2" x 96"
We can't get over how great the Gold color looks in our restaurant.